This short loop provides a nice variety of scenery and a pretty good cardio workout, climbing up the steep west wall of Zuma Canyon. 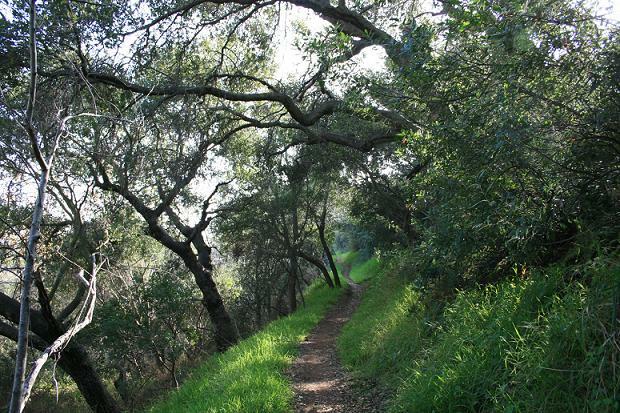 From the Bonsall trailhead, walk north into the canyon. You pass by the Zuma Loop Trail (your return route) and the Ocean View and Canyon View trialheads, both part of another popular loop hike. 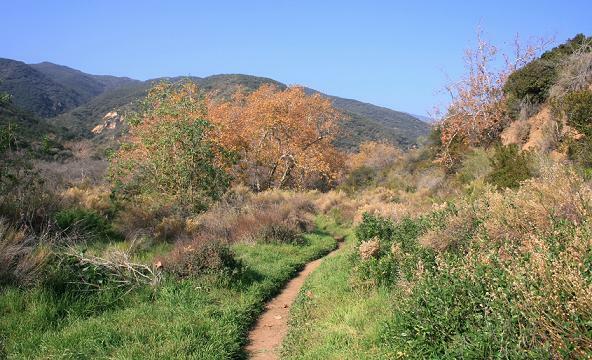 Right after the Canyon View trail, look for the Scenic Trail, and take a right. The Scenic Trail, a short loop of about a quarter mile, lives up to its name, visiting a grassy field, getting up close to the east side of the canyon and providing nice views of the hills above. Soon, the Scenic Trail rejoins the main route. Head right and almost immediately turn left on the Zuma Loop Trail, as the main one continues into the canyon. The Zuma Loop Trail begins its climb, under the shade of some oaks, and starts making switchbacks up the west side of the canyon. You come to a split where the Loop Trail continues to the right, farther uphill (the Rim Trail, which goes straight, is an option if you want a shorter hike). You get nice views of the mountains on the east side of the canyon and of the ocean. After climbing 300 feet from the canyon floor, the trail starts descending. You rejoin the Rim Trail and finally arrive back at the bottom of the canyon. Take a right and retrace your steps back to the parking lot.